Very pleased to announce my new book, co-authored with Nathanial Matthews, is now out with Palgrave Macmillan. A description of the book is below (or here) and the publisher’s website is here. I was delighted by the endorsement from Carl Folke, as one of the key things the book strives for is to get at the core issues in a concise and clear manner. This book presents a historically situated explanation of the rise of global water governance and the contemporary challenges that global water governance seeks to address. It is particularly concerned with connecting what are often technical issues in water management with the social and political structures that affect how technical and scientific advice affects decisions. Schmidt and Matthews are careful to avoid the pitfalls of setting up opposing binaries, such as ‘nature versus culture’ or ‘private versus public’, thereby allowing readers to understand how contests over water governance have been shaped over time and why they will continue to be so. Co-written by an academic and a practitioner, Global Challenges in Water Governance combines the dual concerns for both analytical clarity and practical applicability in a way that is particularly valuable both for educators, researchers, decision-makers, and newcomers to the complexities of water use decisions. Harriet Bulkeley: Can we govern the climate? Here is a lecture by Claudia Pahl-Wostl, a name those in the academic community on water research will be familiar with. I’m in La Crosse, Wisconsin looking out at the Mississippi and very much looking forward to the Water Ethics conference that begins tonight. A very good review of issues in groundwater governance now available (for free!) from WIREs Water. PDF is here. ABSTRACT: Groundwater use, particularly for agricultural purposes, has exploded globally. This was driven by the advent of deep tubewell groundwater lifting technology, state-led incentives for its adoption and de facto groundwater regulatory regimes around the world that by and large gave landowners the right to pump unlimited amounts of groundwater. As a result, many parts of the world are now facing severe groundwater overdraft. This has prompted calls for new forms of decentralized governance specific to groundwater, which has been dominated historically by institutions and policies created to manage surface water. This article makes three interrelated arguments about this regulatory shift. First, the rapid growth of energized groundwater extraction has created an unstable configuration of state actors, groundwater users, abstraction technologies, and flows of water and power. Second, given this heterogeneous assemblage, the dispersed character of groundwater extraction, and its rapid decline, attempts to craft groundwater specific governance are leading to innovations in rendering groundwater and hence its users visible and governable. In turn, this is setting in motion new kinds of groundwater governmentalities as state and civil society institutions attempt to rein in this system. So that third, rather than this leading to truly decentralized groundwater governance, we instead are witnessing a resurgence of the ‘resource-state’ and the recentralization of policies and institutions that attempt to control decentralized groundwater users and ecologies. These are working to dispossess existing users rather than engage them in the policy-making process. The article concludes with avenues for future research on understanding specific ‘groundwater governmentalities’. My article, Water management and the procedural turn: norms and transitions in Alberta, is now out in Water Resources Management. I think it is behind a paywall so if you want a copy feel free to email me. I’m also writing up a guest blog post in ordinary (that is, non-academese) language for the Alberta Water Portal that should be done soon. Water management reforms promoting deliberative, decentralized decision making are often accompanied by procedures designed to accommodate a range of stakeholder perspectives. This paper considers the role of political and ethical norms affecting this ‘procedural turn’ in order to understand the management of transitions in complex socio-technical systems. It examines the discourse and practice of water reforms in Alberta, Canada in order to identify how new procedures were designed alongside changes to management institutions. It finds that the existing social and cultural context is an uneasy fit with procedural norms theorized in deliberative models of democracy. Using examples from the Alberta case, it draws out implications for understanding the procedural turn in water management and the role of norms affecting transitions toward sustainability. 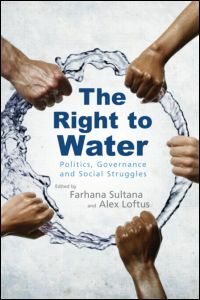 I think I mentioned a while back my chapter for Farhana Sultana and Alex Loftus’ book, The Right to Water. The book was recently reviewed in the journal Antipode; freely available here as a pdf. John Agnew, chair of the geography department at UCLA, provided his thoughts on the book. Overall, the treatment of my chapter on ethics and global water governance is positive. In it, I make the beginning arguments against the intersection of two themes I am now working on. The first is the unquestioned utilitarianism of global water policy. The second is the intersection of utilitarianism with a specific version of what constitutes a ‘community’ in political liberalism. The version of community is not held by all liberals, and certainly not by those living non-liberal forms of life. But it is given global credence. At any rate, it is my first cut on that issue, and I will return to the argument in the last chapters of the book I am drafting. But it will be reformulated (hopefully) more precisely. My latest paper has just come out in the journal Environmental Values, co-written with Dan Shrubsole: “Modern water ethics: implications for shared governance – full reference here or on my ‘publications’ page. This essay formed the literature review for my dissertation so, as you might expect, it has a lot of references to the literature on water ethics. Some recent ones are missing, since the piece was submitted in 2011. Here is the editor’s intro to the essay followed by the abstract. If you’d like a copy of this paper (or any of my papers) I’d be happy to send one. “Schmidt and Shrubsole (2013) argue that the early creators of United States’ water policy saw their policies as an expression of the success of European civilisation. On this view, U.S. utilitarian approaches to water policy should not be seen as attempts to be ‘value neutral’, but rather as attempts to promote a certain set of ethnocentric values. It has been suggested that water and social values were divorced in modernity. This paper argues otherwise. First, it demonstrates the historical link between ethics and politics using the case of American water governance. It engages theories regarding state-centric water planning under ‘high modernism’ and the claim that water was seen as a neutral resource that could be objectively governed. By developing an alternate view from the writings of early American water leaders, J.W. Powell and W.J. McGee, the paper offers a way to understand the project of state-centred governance without the claim that water falls to the latter half of a society/nature dualism. Second, the paper reviews how the emerging ‘water ethics’ discourse helps organise both the ethical and legal norms at play within contemporary political shifts towards decentralised governance. The review identifies how McGee’s early influence may warrant more attention, both in terms of water governance and environmental ethics. The paper concludes by arguing that, given the arguments presented, success in decentralising water governance turns not only on political considerations, but also on fairly ordering normative claims as part of fostering and extending the reach of coordinated water governance. I received this message today, with suggestions to share it around. It does look interesting. Although you will have to look closely at times, I assume those listed are local to Geneva. “On the occasion of the “Meeting on the Post-2015 Development Agenda Consultation on Water: Water Resources Management and Wastewater Management & Water Quality” on 27-28 February in Geneva, the organizers would like to announce that you will be able to view the meeting by live-stream video at http://www.worldwewant2015.org/water. The plenary sessions from 10:00 to 13:00 on 27 February and 15:00-17:30 on 28 February will be available live online. The meeting aims to prepare for the High level Meeting in The Hague which concludes the Thematic Consultation on Water. It will facilitate the development of a short document for each stream that reflects the discussions that have taken place both online and during this meeting, thereby providing a basis, both technically sound and politically strong, for the future discussions in the Open Working Group as well as an input for the High-level Panel of Eminent Persons on the Post-2015 Development Agenda. Please feel free to share with interested colleagues.